The composition of odes to celebrate the new year and the birthday of the monarch was a long standing tradition in England, as a number of works by Purcell and others readily testify. Normally the task of composing such occasional works fell to the Master of the King's (or Queen's) Musick, a position held in the early part of the eighteenth century by John Eccles. However Eccles seems to have provided no such works between 1711 and 1715, a gap filled probably in 1713 for the monarch's birthday by Handel. He had returned to England for a second visit late in 1712, quickly catching the mood of the nation by composing a Te Deum and Jubilate for the service of thanksgiving to celebrate the Peace of Utrecht. It was possibly the success of this piece, the commissioning of which from Handel rather than a native composer has puzzled Handel scholars, which led to him being asked to provide a celebratory ode for the birthday of Queen Anne, February 6. Both the Utrecht Te Deum and the Ode "Eternal Source of Light Divine" demonstrate how clearly he had assimilated the English choral style of Purcell, the sacred work being clearly indebted to the English composer's well-known Te Deum and Jubilate in D of 1694. However Handel's works are planned on a broader scale, with greater prominence given to wind parts. The text by Ambrose Phillips (1674 - 1749) is one of the best examples of a genre that frequently embarrasses modern listeners by its obsequious praise of the subject. Here, however, Handel was provided with a text that not only praises the queen as the author of peace, but includes pastoral imagery of the kind to which Handel always responded with his best music. The result is a seven-movement work that transcends the usual occasional nature of such pieces. 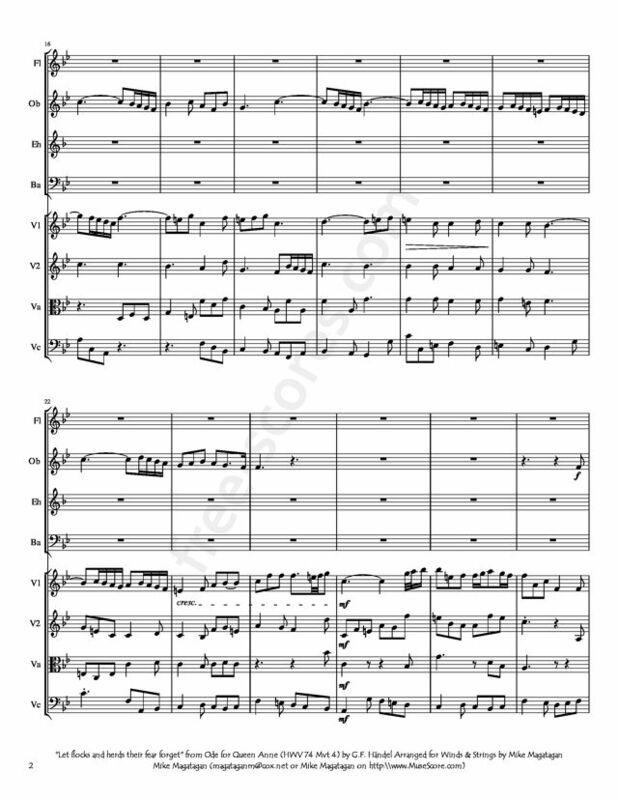 Particularly striking are the opening alto solo, with its demanding obbligato part for solo trumpet, the gentle soprano and alto duet "Kind health descends," and the majestic final lines of the chorus, "The day that gave great Anna birth." Source: Allmusic (https://www.allmusic.com/composition/ode-for-the-birth day-of-queen-anne-eternal-source-of-light-divine-hwv-74 -mc0002355852). 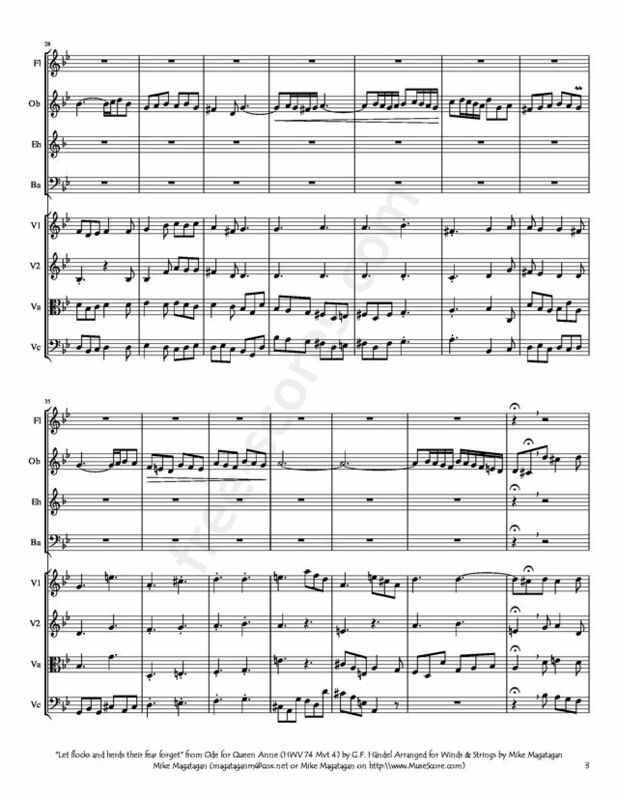 Although originally written for Voices and Baroque Orchestra, I created this Interpretation of the "Let flocks and herds their fear forget" (HWV 74 Mvt. 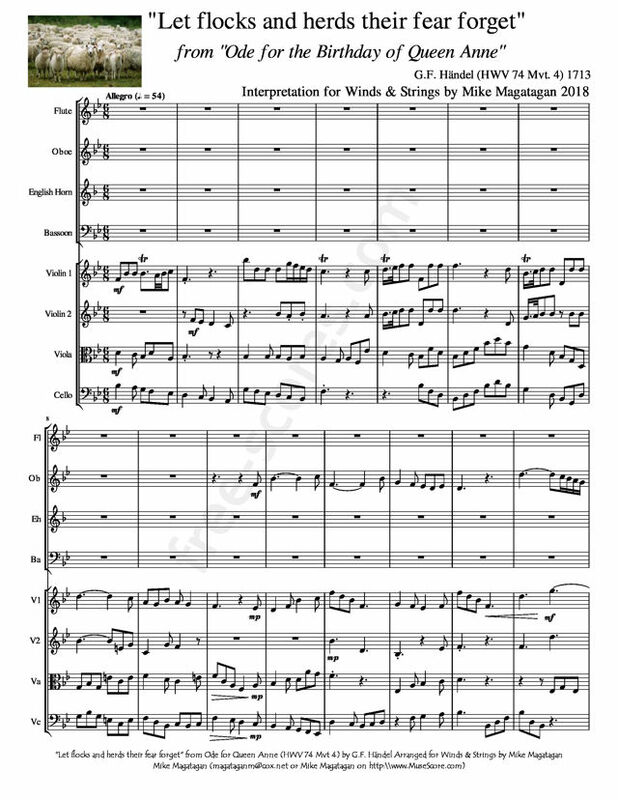 4) for Winds (Flute, Oboe, English Horn & Bassoon) & Strings (2 Violins, Viola & Cello).